- Former ROH TV Champion Punishment Martinez made his NXT TV debut on tonight's show, losing to Matt Riddle. Triple H took to Twitter after the match and congratulated Martinez, writing, "Imposing, unrelenting, focused... and ready. This is just the beginning for @RealPunishment in @WWENXT - I expect to see big things from him. Congratulations on your debut." - Aleister Black will finally get his WWE NXT Title rematch at the upcoming "Takeover: Phoenix" event. Black reportedly spent some time on the shelf with a groin injury following the title loss. 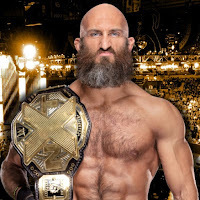 He returned to defeat Johnny Gargano at "Takeover: War Games II" last month, and their feud will now come closer to ending with a Steel Cage match that airs on the December 19 episode. No other matches have been announced for Takeover as of this writing. Female Superstars are currently trying to qualify for a Fatal 4 Way #1 contender's match that will air on the December 26 episode. The winner of that match will face NXT Women's Champion Shayna Baszler at Takeover in Phoenix. Bianca Belair has already qualified. "Takeover: Phoenix" takes place on Saturday, January 26, 2019 from the Talking Stick Resort Arena during WWE Royal Rumble weekend.